So, you're thinking ofbuilding a retaining wall from railway sleepers? Maybe to terrace yourgarden or level out a slope? Maybe to hold back your neighbours creeping soil? 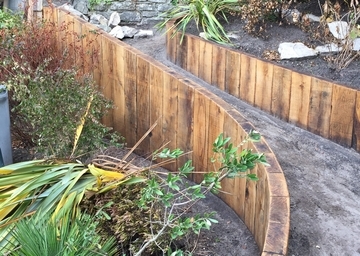 Here is a selection of inspiring and wonderful retaining walls, madeboth from new & used railway sleepers, that have been sent in from our customers. 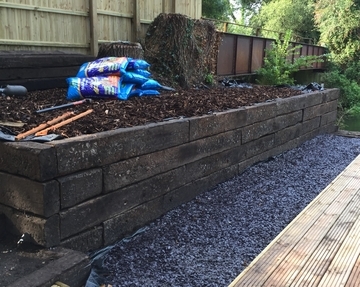 Thank you to all our customers and friends who've sent us photos of their railway sleeper retaining walls, whether in the garden or part of their business, and generously shared their retaining wall projects with us. It's both inspiring and illuminating for others to see what you've created and hear of your struggles or achievements. It's not necessarily about wanting to copy what you've done - more about being given great ideas and endless possibilities. Railway sleeper retaining walls are great alternatives to using bricks or stone. Do you want to make a wall out of railway sleepers, but unsure how? Check out these imaginative and inventive retaining wall projects using railway sleepers.